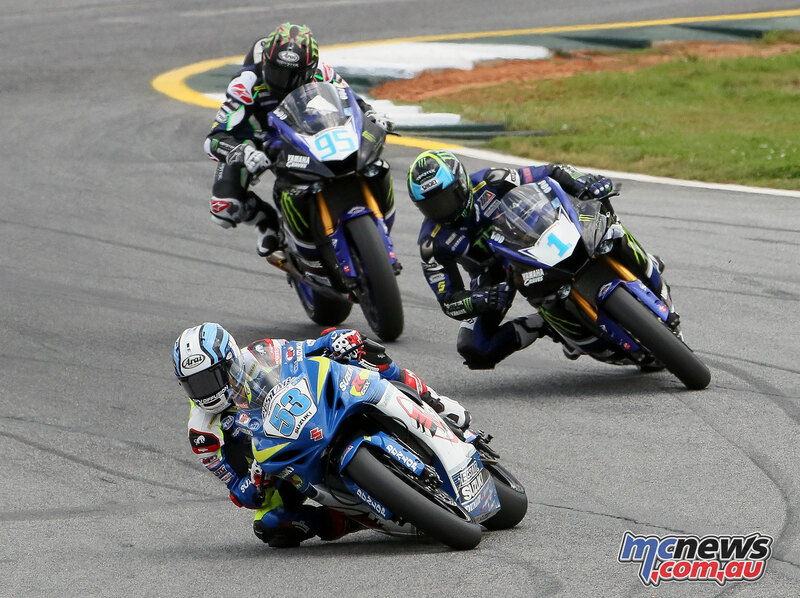 The second day of MotoAmerica saw tempers flare as Cameron Beaubier and Toni Elias had words about the previous days action, with Toni Elias taking the day two victory, and holding on to a strong championship lead in the superbike class. 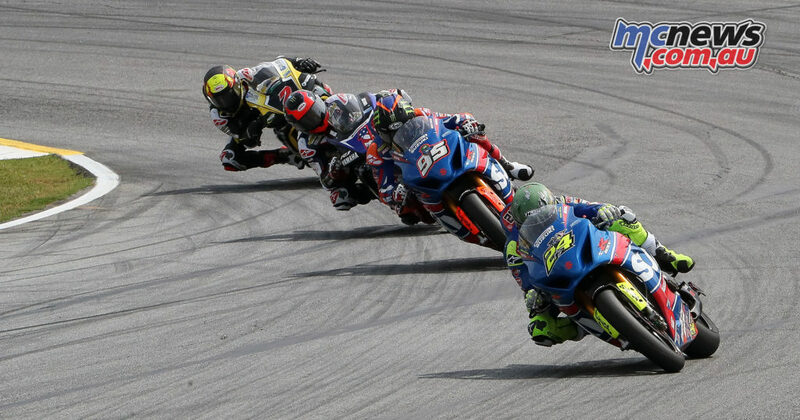 The war of words started yesterday when Elias was angered by Beaubier’s pass in the final corner that pushed Elias onto the grass on the exit of Turn 12. Yoshimura Suzuki Factory Racing’s Elias said he had a long memory, but he didn’t need it as he retaliated quickly in the second race, moving over on Beaubier on the run down to Turn 12, then touching his helmet and looking back at his new rival. The two exchanged words prior to the winner’s circle celebration and that spilled over to the press conference. As for the race itself, it was another thriller with five riders at the front early, a battle that whittled down to three late in the race. Elias ended up beating his Yoshimura Suzuki teammate Roger Hayden by just .308 of a second with Beaubier and his Monster Energy/Yamalube/Yamaha Factory R1 just another .256 of a second behind in third. Josh Herrin rode his Helmet Sounds/Western Services/Meen Racing Yamaha to fourth, some five seconds behind the lead trio and six seconds ahead of fifth-placed Kyle Wyman on the Excelsus Solutions/Lucas Oils/KWR Yamaha YZF-R1. Sixth place went to M4 ECSTAR Suzuki’s Jake Lewis, a spot that put him on top of the Bazzaz Superstock 1000 podium. The win was Lewis’ first in the class and first in his MotoAmerica career. Lewis benefitted by the non-finish of championship points leader Fong and yesterday’s winner Scholtz. Fong crashed his Quicksilver Latus Motors Racing Kawasaki early in the race and Scholtz went out with a mechanical on his Yamalube/Westby Racing Yamaha R1. That means Lewis is now tied with Fong for the lead in the championship with 70 points, five clear of Scholtz. As for the Motul Superbike class points, Elias leads the championship by 26 points after his third win in four races over Beaubier and Hayden, 95-69, with those two tied for second. Herrin is fourth in points with 43 points. 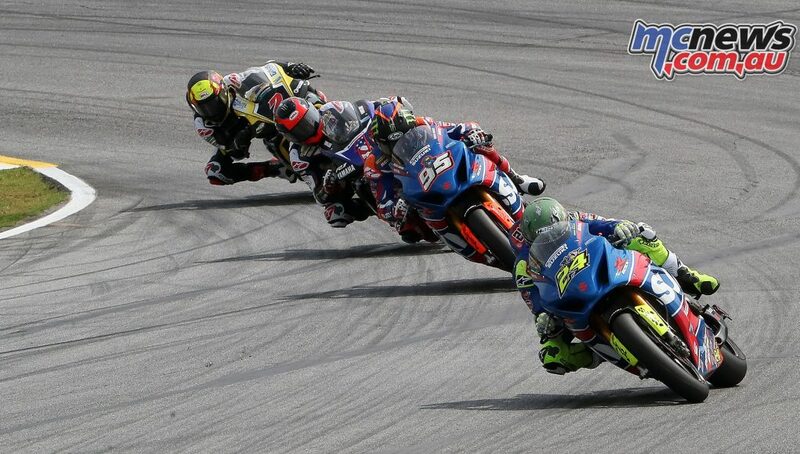 M4 ECSTAR Suzuki’s Valentin Debise won his second career MotoAmerica Supersport race today at Road Atlanta, the Frenchman turning the tables on yesterday’s winner Garrett Gerloff and the Monster/Yamalube/Y.E.S./Graves Yamaha. Again, Gerloff’s teammate JD Beach finished third. With his first win of the season, Debise moves to the lead in the championship over Gerloff, 65-61, with Beach third on 57 points. For the second straight day it was M4 medAge Suzuki’s Nick McFadden taking victory in the Superstock 600 class over yesterday’s third-place finisher Michael Gilbert on the Team MG55 Yamaha. Yesterday’s second-place finisher Jason Aguilar was third today on his Aguilar Racing Yamaha R6. 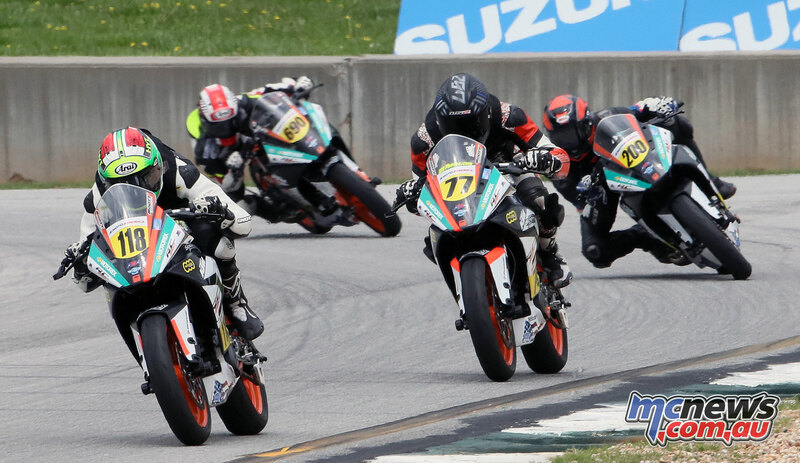 The KTM RC Cup also had its second race of the weekend today and two-thirds of the podium was the same as yesterday. The winner was the same in Quarterley Racing/On Track Development’s Benjamin Smith with his teammate Draik Beauchamp again finishing second. Today’s margin of victory was closer than yesterday’s, with Smith winning by 1.039 seconds. Third place went to Wissel Racing’s Tyler Wissel, the first podium finish of his MotoAmerica career. The 2017 MotoAmerica Series resumes, May 12-14, with the Championship of Virginia at Virginia International Raceway in Alton, Virginia.